Landmark: Steeple of First Religious Society, Unitarian church at 27 School Street, is visible on the hilltop across from Common. From the North: Take Route 3 or Route 4 south to Treble Cove Road toward Carlisle; changes to Maple Street, then East Street in Carlisle. Merge right onto Route 225, go through rotary at Ferns Country Store, turn left after Carlisle rotary onto School Street. Common is on your right. 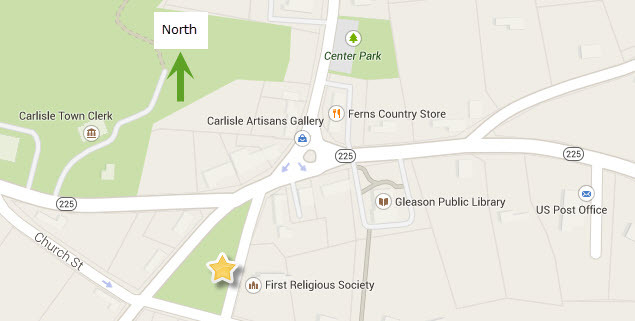 From the West: Take Route 225 from Route 495 into Carlisle Center; turn right onto School Street before you reach the rotary. Common is on your right. From the East: Follow Route 225 off Route 128 through Bedford into Carlisle Center; turn left after Carlisle rotary onto School Street. OR take Route 3 North to Treble Cove Road, then follow instructions from the North. From the South: Take Route 2 to Concord Center; at Monument Square take Lowell Road (to the left of the Colonial Inn) 6 miles to Carlisle Center. Turn right onto Church Street, then turn left onto School Street at the top of the hill. Common is on your left.